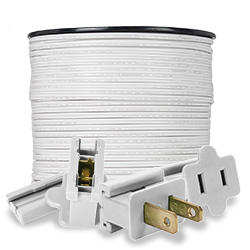 Whether it's zip wire and zip plugs to create custom extension cords, or sockets to create custom string lights, you need high quality, commercial grade accessories to bring your custom lighting creations to life. Every lighting project is different, and bulk zip wire, zip plugs and light sockets give you the flexibility to create displays as unique as your imagination. 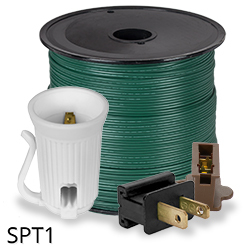 SPT1 wire is meant for light to medium duty use and rated up to 7 amps. SPT2 wire is meant for medium to heavier duty use and rated up to 10 amps. 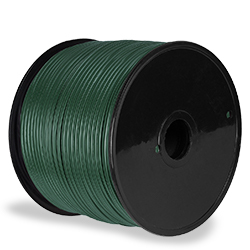 Wintergreen sells zip wire in 100-, 500- and 1,000-foot lengths, allowing you great flexibility for projects large or small. Whether you're a professional decorator or a business that needs to create a custom light display, going with zip wire and creating custom string lights or extension cords is often less expensive and your installations will look far more professional. Example: Let's say you have a cafe with three front windows you'd like to outline with lights from the inside. But you can't have empty sockets between windows because customers will be sitting there. And all of the lights have to plug into a single outlet at the other end of the wall. With zip wire and zip sockets you can perfectly outline each window at precisely the socket spacing you need. You can also allot enough wire to cleanly connect each window without having to worry about extra unused sockets in the middle. Your display will look professional and be safer. Professional installers have been using zip wire for years due to it's ease of use. If making a custom light string with female plugs along the line to split multiple lines in different directions, add inline zip plugs as needed. Lastly, end your string light run by adding a female plug at the end. TIP: If you're not familiar with how to use zip plugs and zip wire, it's important to ensure the polarity of your setup is correct. Zip plugs and zip wire are polarized and there are metal contacts that look like teeth within the plugs and sockets. 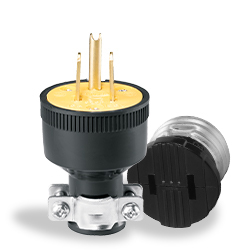 These metal contacts correspond to the large plug blade or the small plug blade. All zip wire is actually two wires fused together. 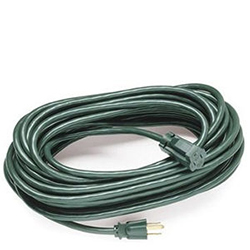 While both wires look the same, one actually has a small ribbed ridge on the outside, which is considered the "neutral" wire. This ridge can be felt with a fingernail. The ridged wire corresponds with the larger plug blade or plug hole -- the neutral side. 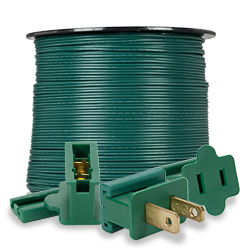 Throughout your string light line or custom extension cord, simply ensure that the correct side of the zip wire is connected to the correct set of metal contacts throughout the run. 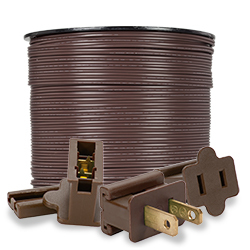 Similarly in sockets, the neutral wire should correspond with the metal contact that is on the socket's side. This will ensure polarity between your plugs and sockets. Remember, anytime you're working with electrical accessories there are a few important safety tips to keep in mind. Zip wire, zip plugs and sockets are a great solution for custom lighting, but they are meant for temporary use only. 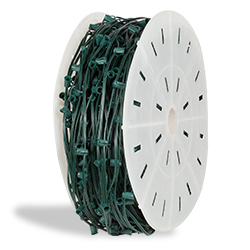 Outdoor string lights should always be plugged into GFCI (or "ground fault") outlets as an added safety measure. 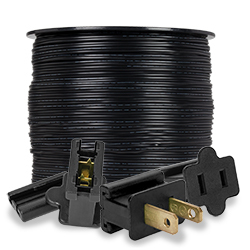 Always maintain polarization when installing zip wire, zip plugs and light sockets. 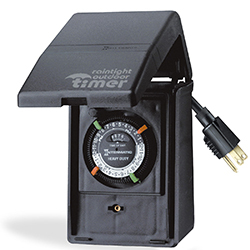 Calculate your total wattage/amperage needs and then always aim to be at around 80% of the line's maximum capacity to keep it performing well. Don't staple gun your lights. This damages the insulation of your wiring. Consider using light clips or hangers instead. If you have any questions, consult a qualified electrician.